NASHVILLE, June 27, 2018 /Christian Newswire/ -- Authentically American™, a veteran-owned start up that offers premium-branded merchandise exclusively made in the USA, today announced that TV broadcaster and NASCAR Hall of Famer Darrell Waltrip has become an investor in the company. 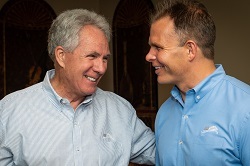 "We are honored that Darrell Waltrip, who embodies Authentically American's spirit and values, has joined our team of investors," said Dean Wegner, a West Point graduate, Army veteran and businessman who founded the company in July 2017 with the intent of helping create American jobs. "After hearing Dean's passion for supporting U.S. workers by selling top quality merchandise that is made in America—and nowhere else—I was hooked. The product and story are so compelling that I decided to invest in Authentically American," said Waltrip, a three-time NASCAR Cup Series champion. Wegner noted that in its first year of operation, Authentically American has served more than 100 customers ranging from Fortune 500 companies and non-profits to small but patriotic businesses. The common thread with Authentically American's customers is their support for 'Made in USA' merchandise and American manufacturing. "We could not be more pleased with what you brought to our organization, and we are excited to expand our designs in the future to maintain a cutting edge of fashion for our company," said Roddy Thompson, director of sales for ITW/Hobart Welding North America. "Your quality is truly amazing and the fact that it is made in America fits our organization perfectly," he added. While organizationally branded merchandise for businesses, political campaigns, schools, nonprofits, etc., comprises the largest part of Authentically American's sales, consumers also can make individual purchases of American-made apparel—ranging from tees to dress shirts—online at authenticallyamerican.us/shop. As part of its expanding product line, the company also has ultra-soft, high-performance medical scrubs that are moisture wicking, antimicrobial and wrinkle resistant. Each item displays Authentically American's vintage USA flag logo, which is available in a variety of colors. Wegner said he and his team aim to build an iconic American brand that is truly American made and sets the standard for 'Made in USA' merchandise. "Guided by values derived from the foundation of our Christian faith and steadfast patriotism, we hold our owners, investors and work family to the highest level of integrity" he added. Every Authentically American product is guaranteed, and the company donates 10% of its revenue to veteran-focused charities. For more information visit www.authenticallyamerican.us.